For our former Keeper to strike such an apocalyptic note in his end of season report clearly indicates that the impact of high temperatures and low water was indeed very severe indeed. Yet, as you will see below, in terms of catch statistics 2018 has been up to the average, and judging by the very helpful comments you have made in your catch returns most of our members have had some very enjoyable and interesting fishing throughout the season. So what are the differences from 1976, and what has changed over the intervening 42 years? In one of the earlier monthly reports this season I said that we had benefited immensely from the very late winter rains. A healthy chalk stream cycle, and the trout fishing potential it carries relies on adequate ground water. Weed growth, water temperature, invertebrate abundance, the condition of spawning gravels and the constraints on algal and silt deposition all respond to the supply of ground water, and this year the springs were running well into June. One obvious effect was that ranunculus was still growing vigorously during the main weed cut in June, but less obvious and just as important, the water temperature was suppressed at the time the really hot weather hit us. This was probably not the case in 1976, when by all accounts there was a dry winter preceding that season, and consequently a lack of precious ground water. The Mayfly hatch was late this year in response to the cold spring and low water temperature. But it gave some really great fishing in late May and early June, and although we have raised our membership ceiling to 150 (from 120), there was no evidence that increased rod pressure caused undue hassle. And although the second half of the season, post-Mayfly, was certainly challenging, the river proved to be remarkably resilient in the hot weather and low flows. Late evening sedge and spent olives, in particular, gave some wonderful moments as you recounted in the catch returns, and as ever the river was under-fished in September and the first fortnight of October when probably the best hatches of small fly took place. Before I give you the actual figures, there are perhaps two other factors which carried us through this summer successfully. The first is certainly the restoration work that has been completed on the river over the past 20 years to correct the over-widened stretches and generate more energy in the flow. In the early days we funded some modest projects ourselves, with help from the Environment Agency. Latterly however, some much more extensive and ambitious projects have been funded by DEFRA across the whole Avon catchment, perhaps the most notable of which on our water was the stretch between Figheldean road bridge and Gunville. This summer has thoroughly tested all the restoration work, and the committee believes it has proved very effective in genuine drought conditions. Incidentally, the committee has made a bid for one last big project from this source of funding, as with Brexit now imminent we cannot expect such large grants to be made available in future. As I mentioned in an earlier report the second factor gives me some personal satisfaction, as our stock fish – destined for the river next April – also made it through the heatwave without any significant losses. As Frank implied in the extract above, such conditions can bring high stock mortality and very expensive restocking bills with them. So our big effort to de-silt and otter-proof the main stock pond was probably achieved in the nick of time, and was well worth every penny. I am once again particularly pleased with the undersized return. This was 702 last season, so in this drought year to be only 53 short of that total does seem to demonstrate that we have managed to establish a stable population of wild fish. The grayling return also indicates a stable population as it is only some 200 short of last season. Corfe End Lakes, on the other hand, is a very disappointing return – and almost identical to last season which was 38. It is interesting that the highest return for the lakes of the past 10 years (220 in 2014) coincided with the highest flows of the period, indeed it was preceded by a winter when the entire valley was under water for several weeks. At the moment, however, it seems that siltation and the consequent shallowing of the lakes is generating such prolific algal growth from mid-May onwards that the lakes become unfishable until the water temperatures fall in the autumn. This is a big problem, and the committee will be looking at it carefully over the next few months. As fish dropped back into the cooler water of the deeper sections of the river it is not surprising that the reach which proved most productive was Reach 7 – from the Gated Crossing up to Choulston bridge. Next in that pecking order was Reach 11 (C Crossing to Gunville) which was also the reach which produced the most wild fish. Thereafter the bag was fairly evenly distributed between the remainder of the water, with the exception of the bottom two reaches (13 and 14) where the returns were dismal. This was almost certainly due to lack of weed (hence lack of cover and loss of invertebrate life). 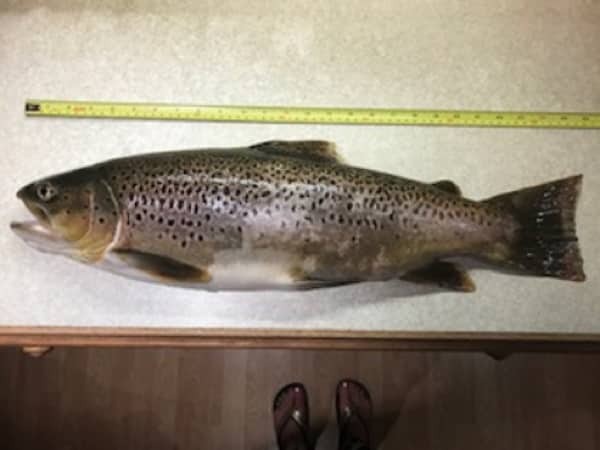 But let it not be forgotten that Reach 13 produced the biggest brown trout we have seen on our water for very many years, so there were surprises even down there. I am afraid that many of our rods will have encountered members of the public on the bank during the hot weather, although our notice boards do seem to deter most casual walkers other than around the mill pools and tank crossings. There is little we can do about this and our view is that this did not affect the enjoyment of the river and the fishing to any great extent. Poaching is a different matter, as this is a criminal offence, and regrettably, there were several instances of this during the season, particularly at Gunville mill pool. Thank you for reporting them promptly. I hope very much that you have all enjoyed this unusual season, despite the various difficulties and challenges it produced. As you can imagine I am very pleased indeed that the results show that the fishery seems to be in a more resilient and healthy state than perhaps it was in 1976 – although Frank would probably disagree! And finally, thank you for all your excellent and interesting comments in the catch returns – they have been a great help to me and to the committee.